Did you know that in may cases your physio can help? One of the most common causes of vertigo – that horrible head spinning sensation – is a highly treatable condition known as benign paroxysmal positional vertigo or BPPV to its friends. BPPV is a mechanical problem in the inner ear. 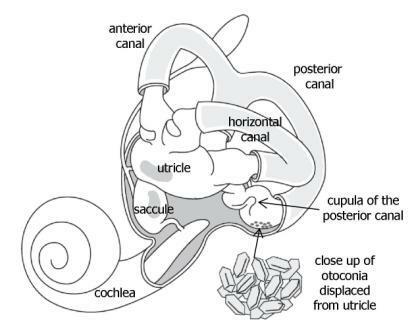 Within the labyrinth of the inner ear are collections of tiny calcium carbonate crystals known as otoconia. These otoconia are normally embedded in gel in the utricle but with BPPV they become dislodged and migrate into one or more of the 3 fluid-filled semicircular canals. When enough of these particles accumulate in one of the canals they interfere with the normal fluid movement that these canals use to sense head motion, causing the inner ear to send false signals to the brain. The signals coming from the inner ear of someone with BPPV do not match the competing information coming from the eyes, or from the receptors in the the muscles, tendons and joints. It is this this mismatch of information that is perceived by the brain as a spinning sensation, or vertigo. BPPV is differentiated from other vertigo inducing conditions because of the absence of neurological symptoms such as numbness, weakness, pins & needles, difficulty with speech or movement. BPPV-related dizziness is also typified by a change in symptoms associated with movement or positional change of the head, neck and body. BPPV can be triggered by any actions which stimulate the semi-circular canal of the inner ear. Patients have reported an onset of symptoms after simply rolling over in bed or after looking up or tilting the head. In the majority of cases BPPV can be corrected mechanically through a repositioning manoeuvre such as the Epley or Semont Manoeuvre. These manoeuvres make use of gravity to guide the crystals back to where they are supposed to be. The physio or treating practitioner positions the patient in a particular way to enable the crystal sediments to return to the utricle. In some cases the vertigo is resolved immediately upon the first session in others, particularly where the BPPV is severe, multiple treatments are required.